There's nothing better than getting home from work on a sweltering afternoon, switching on the ceiling fan, and relaxing in comfort with that fan passing over your head, cooling down your hot, stressful day. Ceiling fans can make life a great deal more comfortable, and they can save money on cooling bills as well. In fact, if you've got good ceiling fans in a few rooms of your house, you probably don't even need an expensive, bulky air conditioning unit. More than likely, you've thought about how great ceiling fans can be. Not only do they cool down rooms, but a beautiful ceiling fan in the right style and color can change the entire ambience of a room. A ceiling fan is defined as a mechanical fan, usually electrically powered, that is suspended from the ceiling of a room that uses rotating paddles to circulate air. But does that really explain what a happens in a ceiling fan that brings so much comfort to life? How do these great mechanisms work? Ceiling fans have been around in the U.S. since the late 1800s. Just as with air conditioning, water was the means of powering the first known ceiling fans. This was used along with a turbine, and the whole thing worked together to drive a system of belts that turned blades. This action pushed the air around, thereby cooling a room. The first ceiling fan that was powered by electronic parts was invented in 1882 (and later patented in 1887) by mechanical engineer Philip Diehl, who was a contemporary of Thomas Edison. This device was a fan blade mounted on a sewing machine motor and attached to the ceiling. Diehl later added a light fixture. 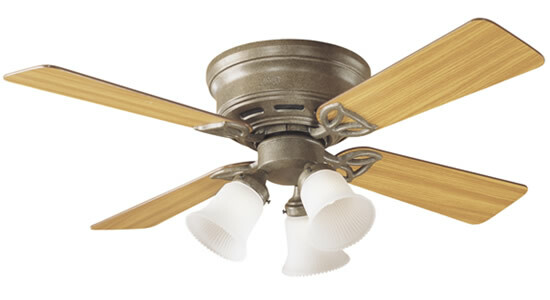 The basic parts of a ceiling fan are an electric motor, capacitor, blades or paddles, metal arms, flywheel, rotor, encasement or 'motor housing,' and switch housing. There are other electric components involved, but these are the main parts needed to make a ceiling fan do its magic. The electric motor is the electric machine within the ceiling fan that converts electrical energy into mechanical energy. A ceiling fan capacitor is necessary for the motor to get up enough torque to run. The blades are usually made from plastic, wood, plywood, or aluminum. The metal arms, or 'blade irons,' are what hold the blades and connect them with the electric motor. The flywheel is attached to the shaft of the motor and the blade irons. The inner ring of the flywheel is locked to the shaft by a screw and the blade irons to the outer ring by bolts. The rotor, an alternative to blade irons, secures the blades and bolts to the motor, which helps to eliminate balance problems. The motor housing, aptly named, houses the motor. The switch housing, or 'switch cup,' is a cylinder that mounts below the fan's motor and is used to conceal and protect various electronic components such as wires and capacitors. This type of fan is wired through the ceiling and connected to the wire that controls either a remote box or a switch on the wall for operating. The ceiling fan capacitor torques up the electric motor, allowing it to start and run. An electrical current reaches the motor and then enters coils of wire that are wrapped around a metal base. As this current passes through the wire, a magnetic field is caused that expends force in a clockwise motion that actually changes the electric energy into mechanical energy. This action causes the motor coils to spin. As the coils are spinning, the fan captures this spinning motion, transferring it to the fan blades. The slicing of the air caused by the fan blades is what pushes the air downward, causing the breeze created by the ceiling fan. This whole process circulates the air through the room, as air moves in to replace the air that has been pushed down from the ceiling. Ceiling fans work are so effective because of the fact that hot air rises. As the hot air reaches the ceiling, it builds up the heat in the entire room. A fan mounted on the ceiling forces this hot air away from the top of the room, and this action leaves room for more hot air to rise, thus circulating the air in the room causing the breeze. It is this action that can make ceiling fans effective in any season.